Rail operator Cross Country says it will do all it can to help develop a business case for a new train station at Kenilworth. 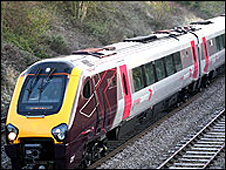 Cross Country took over the local franchise from Virgin last November and spokesman David Ewart says the company will help push the idea. The town has not had a station for many years but a campaign for a new one has now begun. MP Jeremy Wright said he was delighted with the firm's attitude. He said he had been worried about persuading a train company to use the station. Now that hurdle seemed to be over they were considerably closer to providing the town with the station it needed and deserved, he said.